Art has a special place in my heart as it has always been my way of communicating and connecting to the world around me. I have always had a passion for art. Before I could even speak, I was drawing to communicate ideas. My family encouraged my artistic endeavors by signing me up for after school art programs. I fell in love with watercolor painting after my first class with Mark Silvers at the age of 7. My journey continued through exploring oil painting in 6th grade at the Westin Art Academy in Fort Collins, CO.
At Rocky Mountain High School, I was very supported and encouraged to grow as an artist by my teachers. I explored a new medium to me --pottery -- under Ricky Takahashi. I developed great technical drawing skills under Missy Wolf. I was pushed to grow and expand my artistic style in an AP art studio class taught my Jay Dukart. 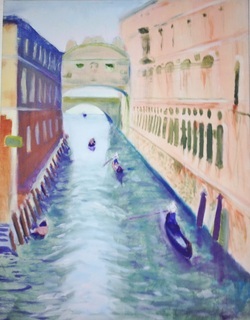 My painting abilities grew to new levels under the tutelage of Daniel Ibanez with his plain air painting classes offered in the summer and a trip to Italy to explore the Masterpieces. Overall, my experience at Rocky pushed me as an artist, encouraged me to be the best artist I could be, and ultimately inspired me to become a teacher. I was honored to be selected for the legacy project, where one of my paintings was bought to hang on the walls of my Alma mater. At Colorado State University, I became familiar with contemporary art and explored new mediums while growing as a painter. I learned that I loved almost every medium I picked up, including drawing, sculpting, figure drawing, pottery, photography, and fibers. I was encouraged to work large scale and develop my own style by Paul Flippen and Dave Yust. I was pushed to put all my effort into painting by Patrice Sullivan. Outside of school, I began to develop my own interests that related to art. My love for art history blossomed as I traveled in Europe during my study abroad, and I recorded this love in the form of digital photography. I began to sell prints of my photographs. I also began to delve into the world of illustration. Encouraged by an author, I began to develop my own children's book and illustrate it traditionally using watercolor. I also became interested in the world of fashion, making and selling purses and hair accessories. Currently, I am exploring jewelry-making in a class at Front Range Community College. I also have become familiar with 123DCatch, Laser printers,Rhino, and 3D printing. I am becoming more familiar with photoshop, ArtRage, Illustrator, and other digital art programs. My goal is to be able to illustrate digitally soon.